I love street markets. Not only because you get more bang for your shopping buck, but more because there’s so much street food to enjoy! 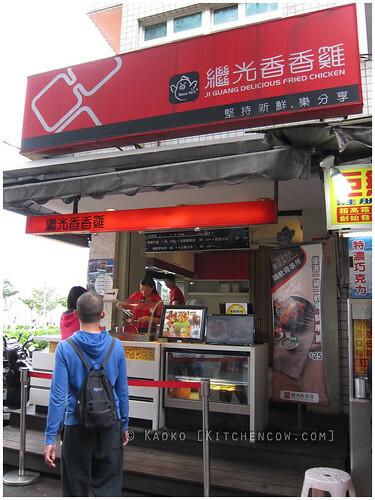 That’s why our first stop during our recent trip to Taiwan was Danshui Old Street. Located outside the Northernmost tip of the Tamsui – Xindian Line along the MRT, Danshui is a pretty old seaside district in Taipei. Actually, Danshui is its old name. It’s now called Tamsui, but since the references I’ve seen all referred to the place as Danshui, that’s what I got used to calling it. Danshui Old Street starts right where the Tamsui MRT station ends. Danshui Old Street is an interconnected network of streets and alleys littered with shops, food stalls and gaming places. By gaming places, I mean old school boardwalk-style games like darts and ring toss. It was lunch time when we got to the Old Street area so food was our first priority. 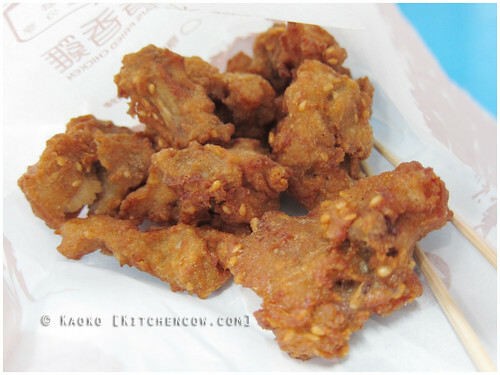 I’m a fan of the boneless chopped fried chicken sold in our local milk tea stalls, so we immediately purchased a bag of the chicken popcorn from Ji Guang Delicious Fried Chicken, the first stall we encountered along the street. It wasn’t quite what I expected though. Unlike the local chopped chicken, Ji Guang’s chicken has stronger Asian flavors. It tasted of sesame and a hint of chili, and others I can’t even start identifying. It also had a lot of tiny bones, as Ji Guang’s chicken is made from chopped whole chicken and not boneless fillets. It’s a bit messier to eat since you have to pick out the tiny bones, but I imagine it would be good to eat with rice. No English? Eating, turo-turo style! Wanting to find a place to sit for a proper meal, we stopped for lunch in a small shop specializing in various soupy dishes. 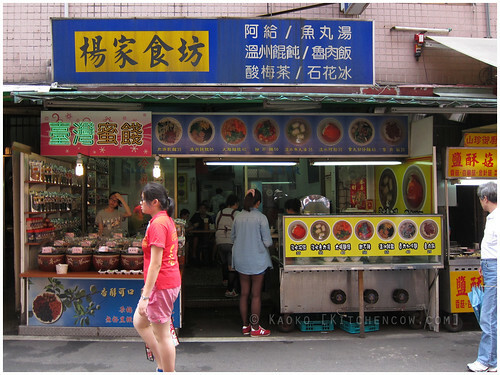 Having zero Chinese comprehension, we settled for pointing out what we wanted to eat from the photos posted outside. Thankfully, one of the ladies manning the store came out from inside and started addressing us in English and even a smattering of Filipino. It was a drizzly morning so soup was the order of the day. 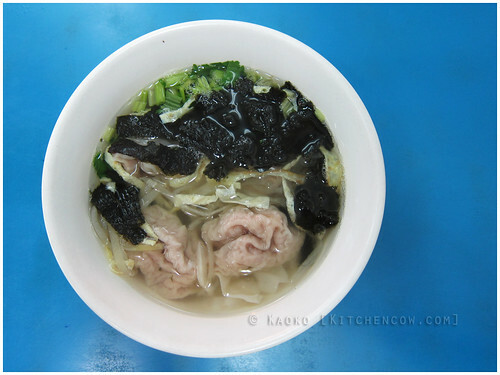 We got a serving of fishballs stuffed with minced meat and a bowl of dumplings with seaweed, celery and some unidentified vegetable that was very similar to bamboo shoots. Could be bamboo shoots actually, I just couldn’t ask to confirm. Both had a very light vegetable broth that tasted strongly of celery. 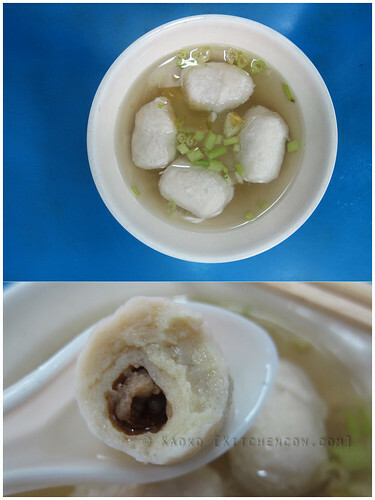 Both hit the spot during that breezy morning, though I’m partial to the dumplings over the fishballs. Boys will be boys, so Pad had to order more food. We couldn’t articulate ordering a bowl of just plain rice (since we still had our Ji Guang Chicken with us) so he settled for a bowl of their minced meat rice. It wasn’t a bad choice. The savory pork topping was tasty enough. What was interesting though was an observation we’d make during the whole trip: Taiwan has excellent rice! 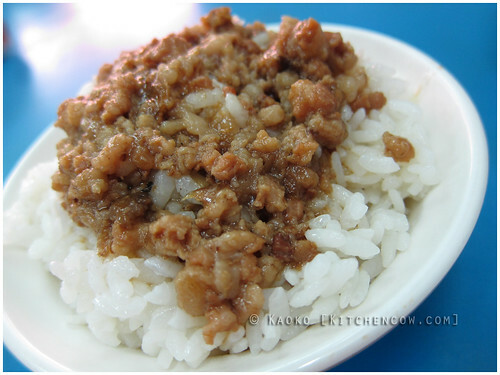 Everywhere we went, the rice was fragrant with a nice firm yet soft texture. And this small street side eatery’s rice was no exception. One thing about that little eatery is that they don’t sell drinks. Not even bottled water. 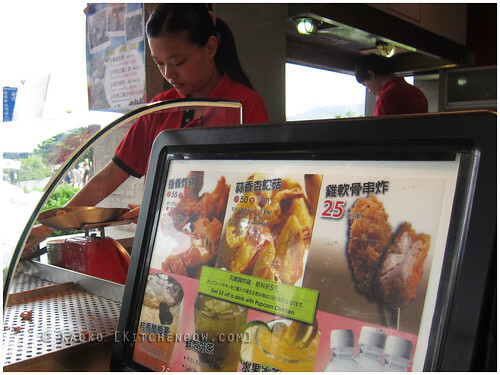 While we purchased a glass of sugarcane juice from another stall to enjoy with our meal, it wasn’t enough so we ended up purchasing more drinks at a nearby refreshment stand. While Pad got the drink from the big open tub (a refreshing citrusy gulaman like drink, complete with jelly bits), I got curious about a jar that seemed to hold frog eggs, so I gamely purchased a tumbler. 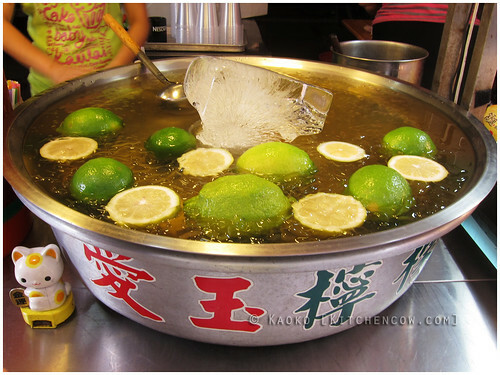 What I got was a light, sweet and tart drink with pulpy little balls. Instead of being slimy as one would think, it’s actually fruit-like, with a pulp and seed structure. We tried asking what it was, but the lady, after trying to explain, just ended up laughing apologetically at us. I ended up taking a photograph of the jar’s label. My friend Y, after seeing the kanji, identified it as basil seeds. Not what I expected. The sight of brightly colored candied strawberries and cherries skewered on sticks caught my eye and I found myself unable to resist. The first time I’ve seen this was from Chris’ Beijing trip and since then, I was itching to try it myself. I purchased a stick with strawberries and cherries, gleefully biting into the large strawberry. Disappointment filled my face. Granted, I expected it to be on the sweet side since it was candied and all, but the strawberry itself was a disappointment. It was on the mushy side, probably due to the heat of the candy process as well as from being exposed in the muggy atmosphere. I decided to try the cherry next. It was a cherry all right. A cherry tomato. What’s sad is that despite it being a cherry tomato, it was slightly better than the strawberry, most likely because the tomato held up better to the heat. It was my first real letdown since we started walking through the streets and I found myself looking for a trash bin to throw the rest away. Eat kamote, the musical root! We fared better with a serving of candied sweet potatoes. It was very much like kamote-cue, though the sugary coating was smoother and crunchier, more like candied sweet potatoes than the fried sugar coating we’re used to. 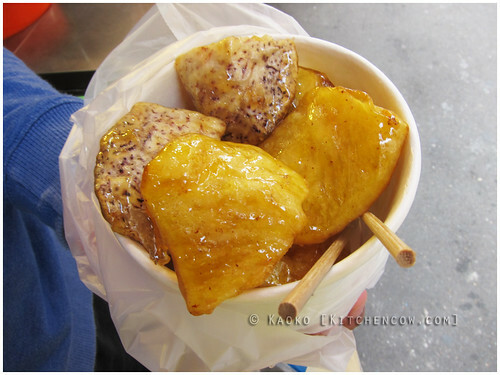 Also included in the mix was a few pieces of candied taro, adding variety with its firmer bite. While walking, we chanced upon a kid drinking Yakult. Pad got envious so we stepped inside a 7-11 just so he could buy one. 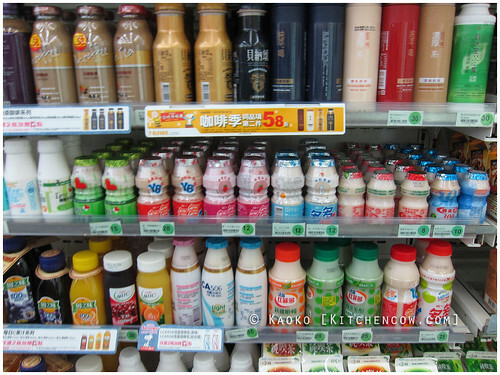 We were greeted by a shelf that didn’t just have Yakult, but had a variety of competing brands of yogurt-based drinks. In large sizes! It’s always been a dream of ours to encounter gigantor-sized Yakult. Unfortunately, these were different brands so we settled for the usual miniscule bottle. The last stall we hit was one that sold quail eggs on a stick. The warm, rich and creamy quail eggs had a thin crust that was as crisp as it was delicate. Topped with a thin, shoyu based sauce (or a dry pepper mix if you’d prefer), it was addictive and spectacular. I was wondering about what kind of batter they used until Pad pointed out that they didn’t use anything. 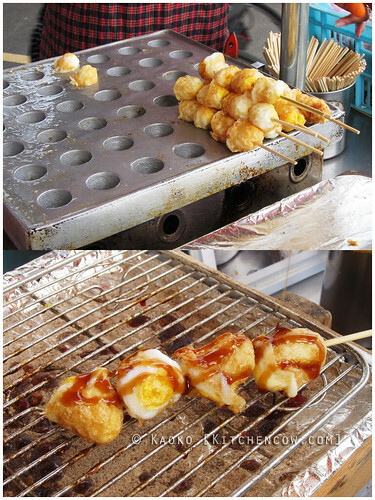 The vendor started cooking by cracking a quail egg on her greased griddle, then flipped it over as it cooked, ala takoyaki. Astounding. 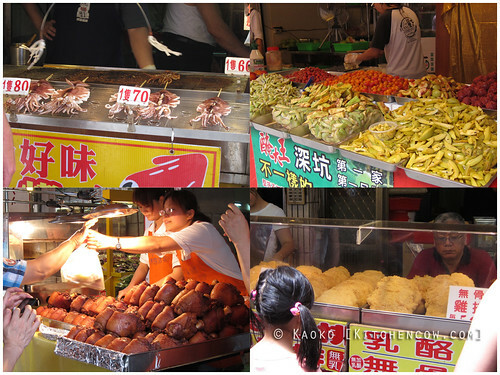 The food selections in Danshui Old Street seem endless. Grilled squid, gigantor-sized pork chops, preserved fruits, large fried pork knuckles, DIY cotton candy, cheesy potato croquettes, foot-high ice cream cones, almond jelly, stuffed bean curd — it really is a foodie’s paradise, so you better be ready with an empty stomach when you head here. Interested in our itinerary? 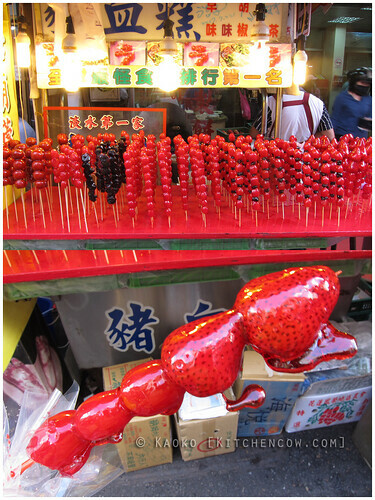 Take a peek at our Taipei Travel Diaries on Kingdom Cow. This entry was posted in food trips. Bookmark the permalink. Yep, they are. 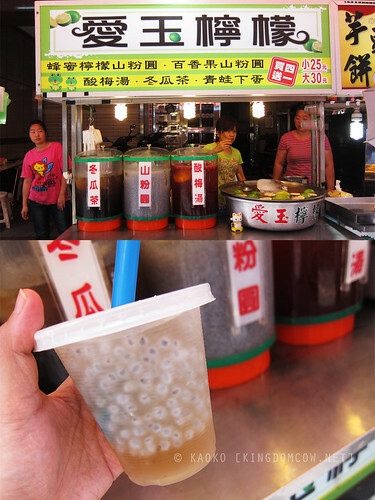 They’re basil seeds that are soaked in water to form that pulpy, jelly-like outer covering. Amazing! I can’t wait for the next part!